The RSPCA is not there for "all creatures great and small" when they enter into financial business arrangements with the very industry that breeds, confines, mutilates and brutally kills animals. The RSPCA's 'Paw of Approval' scheme is an absolute betrayal to the defenceless animals in dire need of their help. The animals are suffering while the public (who trust the RSPCA to help and save animals) is deceived. FREE-RANGE farmers are urging the consumer watchdog to investigate the RSPCA's standards for pork products sold in supermarkets, warning the RSPCA logo dupes consumers into thinking they are buying free-range. Humane Choice, which accredits free-range egg, beef and pork farms, has lodged a complaint with the Australian Competition and Consumer Commission, alleging the RSPCA's labelling is misleading. The RSPCA revised its approved farming scheme for pigs in August, removing references to ''free-range'' when it classified and labelled pig production systems. Lee McCosker, a spokeswoman for Humane Choice, said consumers would see the RSPCA logo on pork and assume it was ''true free-range'' despite the logo allowing pigs to live in potentially ''terrible conditions''. Ms McCosker said the RSPCA had a commercial arrangement with the companies and received 2 per cent of sales. 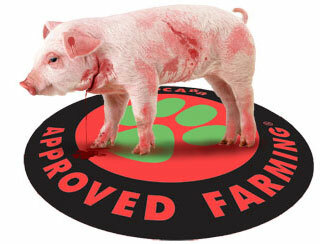 Many of the country's largest suppliers pay the RSPCA to accredit their pork, which allows them to display the RSPCA logo. A spokeswoman for the RSPCA said there were no legal definitions for production systems in the pork industry, so it was up to brands to choose how products were labelled. ''We believe it is important that, in association with the government … the pig industry themselves develop and agree on appropriate production system descriptors … that meet consumer expectations and can be legally defined,'' she said. Please send your complaint to the RSPCA (scoll to the bottom of this link to fill out RSPCA's contact form). Tell them if it wrong for them to be in business with the animal industry and to financially benefit from the suffering of animals.